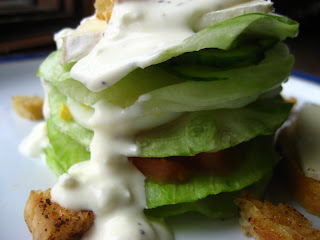 Layered Cobb Salad.... This is my version of a Cobb salad... without the bacon. Is there such a thing as a Cobb salad without bacon? I just didn't have any around the house, so I left it out:). But add some bacon, if you have it on hand. 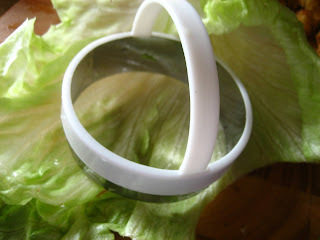 I originally saw this cute idea on a food blog awhile back. I didn't bookmark it though, so I did my best to duplicate it. 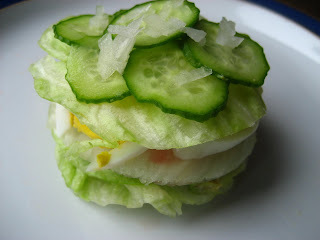 I thought how cute!...to be able to turn an ordinary salad into something a bit more fancy. 1. 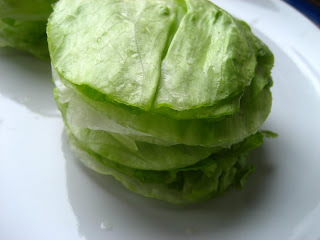 Wash and pat dry the iceburg lettuce leaves. 2. Cut out circles using a round cutter. I used a biscuit cutter about 3 inch in diameter. You can definitely use a larger one. I think if the circle is smaller than 3 inch, it might topple on you. I think a 4 inch would be ideal. 3. 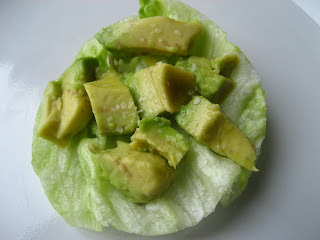 Place a round circle of lettuce on plate add about 2-3 tsps of avocado(sprinkle with a bit of kosher salt). 4. 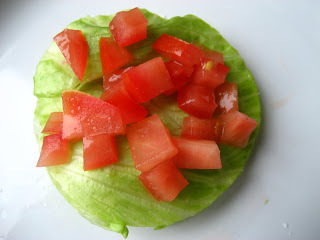 Add second lettuce circle. 5. Place about 2-3 tsps of diced tomato. 5. Add third lettuce circle. 6. 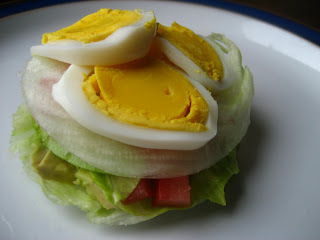 Place 2-3 slices of hard boiled egg. 7. Add fourth lettuce circle. 8. Place 2-3 slices of cucumber with about 1 tsp diced onion. 9. Add last layer of lettuce. 10. Top with blue cheese/bacon bits/ croutons. 11. Pour a bit of salad dressing. 12. 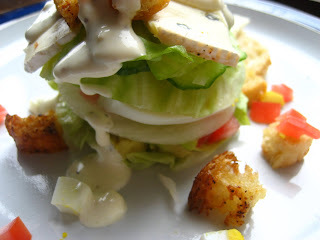 Arrange (if you like) some croutons and/or any ingredients you may like around. Serve immediately.